I'm going to post my full review of this Stanley Nelson documentary next month (in time for its September 2nd release), but you should definitely take a look at the official trailer for THE BLACK PANTHERS: VANGUARD OF THE REVOLUTION. The rise and fall of the Black Panther Party during the 1960s and beyond is a uniquely American story of a growing pride in black culture, and militant demands for justice and racial equality. The film’s cast of larger-than-life personalities includes: Huey Newton, Bobby Seale, Eldridge and Kathleen Cleaver, and Fred Hampton. 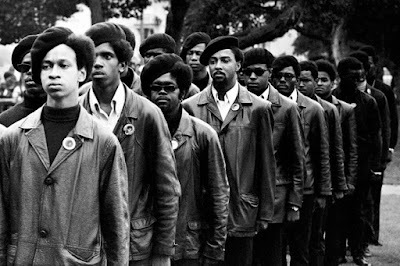 Director Stanley Nelson masterfully assembles rare archival footage that contextualizes the history of the Panthers – begun in response to racism and police brutality in Oakland, California. Surviving members of the organization are interviewed alongside retired police officers, FBI informants, journalists, and others – all of whom reflect back in detail on the events that defined the Panthers’ turbulent late ‘60s era. THE BLACK PANTHERS does not hesitate to critique its subject, nor does it shy away from judging the corrupt activities of J. Edgar Hoover’s FBI or the countless shoot-outs, raids and arrests that were the response of local police. It is a vibrant chronicle of a pivotal movement and a history that needs to be told to understand today’s still incendiary racial landscape.